Hello young ones, it's summer time. Hope you all must be enjoying your vacation time. So here we are, coming up with some interesting age old moral stories for you. 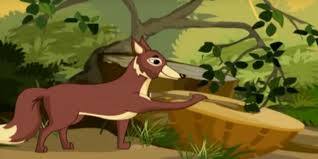 Well this is an interesting story about a jackal who gets scared with the sound made by an old war drum. One fine day a hungry jackal named Gomaya was wandering in a forest in search of food. He searched and searched and searched and reached an old battlefield. "Oh no. I'm damn tired. I can't move further", said Gomaya o himself. "Whir Whoosh!, Swish Boom!... Dur Disshh! .... Swish Boom". Suddenly he heard a strange sound and was terribly scared and started running out of the place. "Oh God! I'm so exhausted. I can't run any more" said the jackal to himself. Gomaya' stopped fleeing and thought, "Come what may. Let me go and find out where from the sound is coming". The jackal took courage and cautiously crept forward in the direction of the sound. "O hoho! O haha! haha! hee! hee!" Gomaya laughed heartily on finding out. "What a fool I had been" he said to himself. That was an old discarded war drum producing the sound. It was lying under a huge tree. When strong winds were blowing the branches rubbed on the drum and produced the sound. And lo! there was lot of food beside the drum which might have been left by some traveler. "O! what a luck! ", thought Gomaya and happily relished the food. Children, isn't that a wonderful story with a good moral value. Well, what did we learn from this story? Moral: Do not fear unnecessarily. But be brave, go ahead and achieve success.